3 Steps to verify your first list. 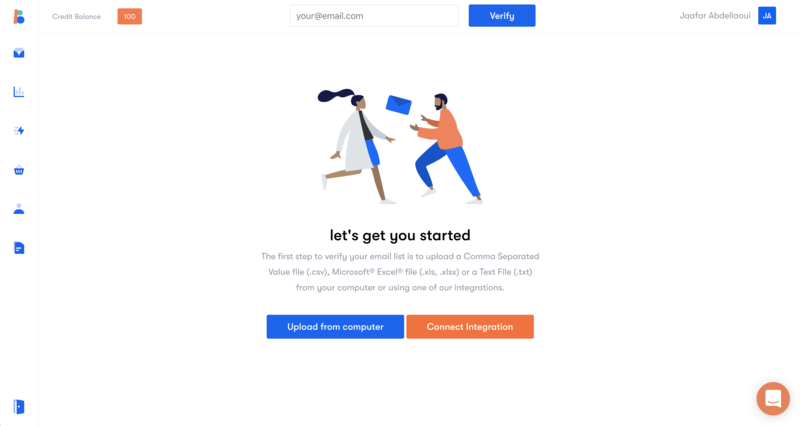 The first step to verify your email list, is to upload a Comma Separated Value file (.csv), Microsoft® Excel® files (.xls, .xlsx) or a Text File (.txt) from your computer or using one of our integrations. Our verification system can process files containing additional columns such as names and addresses. Your list should contain one (and only one) email address in each row. The first row in your list can (optionally) contain field names. Email addresses should appear in the same column in each row. 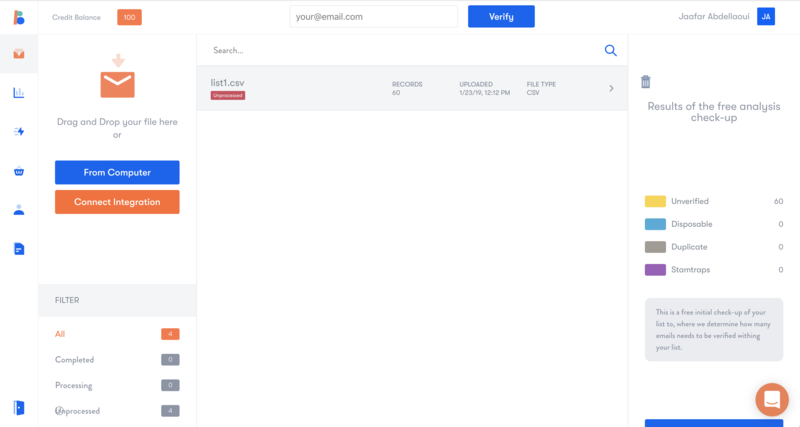 Right after you sign up for Bounceless you will see this screen, to upload your first list just click on "Upload List" and you can select a file from you computer or from various cloud services like Dropbox, Google Drive, Box, Amazon Cloud Drive and Evernote or even from your FTP server. After your upload you list, we run a free analysis to check your lists health. we check for Disposable, Spamtraps, and duplicate emails. to proceed for the verification, you must click "Start Verifying", please be aware that starting this point we will credit you account by the number of emails within your list and you won't be able to cancel the process once initiated. After your list is completely processed, you have to click on "Download Results" and then you will get to customize your report and select the type of emails you would like to download, All Results, Deliverable, Invalid, Disposable, Accept All, Unknown or Spamtrap. Once you select the type of emails you would like to download you can download either a CSV or XLS files.